You can never go wrong with a Donovan brothers centric hour of Ray Donovan. 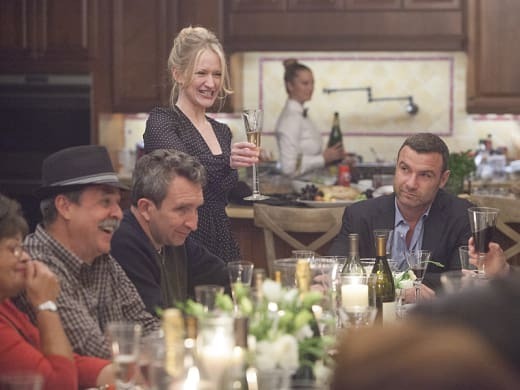 It was Bunchy's wedding day on Ray Donovan Season 3 Episode 9, and with that as the main focus, left behind were most of the guest stars and secondary characters, allowing for a renewed emphasis on the family. It was a fantastic installment of the series, filled with genuine emotion and one welcome surprise. The writing on "The Octopus" seemed tighter than usual, but that could be due to the fact so much of the story was self contained. We've been long overdue for an in-depth visit with the Donovans, and Bunchy's wedding was the perfect time to do it. There was no loss not checking in with the Finneys, and yet they were still present in some way due to the NFL deal hiccup. Can you believe Mickey Donovan? Only he would think skipping town when the cops were looking for him would in some way allow him to get to his son's wedding. It was a nice twist that he was leaving as a way to attend Bunchy's wedding, as it never crossed my mind he thought that would work out. He has such a singular focus – it's all about Mickey – that he doesn't just forget the consequences of his actions, he really doesn't know they exist. Why did Lady Cop go after Bunchy for a mere 17 counts of pimping and racketeering when she could have gone after Daryll for many more? It seems Daryll is the son living the life closest to his father's, who feels little heat as a result of the constant shenanigans they're into. It was also apparent Daryll didn't grow up with the family when he called Bunch's wedding reception the "after party." Doesn't everybody know it's called a wedding reception? Sorry. I digress. There were so many moments to love between family members. Abby and Terry at the liquor store was an unforeseen standout. Eddie Marsan is doing a remarkable job showing the progression of Terry's Parkinson's. Even his walk has really changed recently. Taking Terry into their home seems to be bringing Ray and Abby closer, as well. It's giving Ray a chance to see Abby as a woman who loves and isn't always nagging. Sometimes he forgets all that he does to incur her less than lovable feelings, so seeing the look of admiration on his face as Abby and Terry danced reminded us why they remain married. This was really an hour for the Donovan brothers to shine. Ray and Bunch shared some beautiful moments, not only at the apartment before Bunch was arrested, but at the reception when Ray gave his best man speech. He had to overcome his rehearsal dinner speech and did a bang up job of it. Passing the torch to Teresa as the one who will care for Bunch going forward was so touching. It might have taken a background check to get there, but it's only because of their history. There is such a deep love between these brothers, all three of them, and they have been through so much over the years. This episode managed to capture it brilliantly. Sadly, Bunch became a true Donovan on the day of his wedding. He always dabbled, but by lying to Teresa before they tied the knot, he went into this marriage dishonestly. Terry couldn't even go into a new love like that, which is why things fell apart between him and Francis. He told her too much, she couldn't handle it, and she left. Which is worse? I'd rather know the truth. Teresa would have handled the arrest just fine. What about that surprise appearance from a face of the past? Bringing back Ed Cochran as a way to tie Ray's former life into his new one with the Finneys was really well done. Hank Azaria's performance as Cochran during Ray Donovan Season 2 was both sinister and comical, and we got a reminder of the lighter side when he was doing affirmations at lunch. Life hasn't been kind to Cochran since he had his run-in with the Donovans. We can probably rest assured he'll do his best to connect Ray to Varick's disappearance. Working in a cubicle for an investigative service and being the odd dude who spells like hand lotion might put an even bigger chip on your shoulder than when you were aiming to head up the entirety of the FBI. Now we need to worry about Ray again. Everything he has done in the past will someday come back to haunt him. Nothing stays buried forever, even if someone promises it will. Not until you pay the ultimate price for it. Even then, loose ends are always dangling. Ray asked Bunch to stop working for Mickey after he bailed him out. Surely Mickey can't continue along the line of work now that he's been tagged by the cops, right? It's time for Conor to have a story. We can skip a drug storyline, as Bridget has one of those now. Why isn't he training to fight at Fite Club or something? I cried twice. First after Terry's scene in the bedroom when he had the nightmare. That was powerful. Again when Mickey realized he inadvertently let his son get arrested in his stead. He looked so downtrodden in his suit. The Donovan boys clean up nice. What a handsome bunch in their suits! I'm really not looking forward to more of the Donellen story in Ray Donovan Season 3 Episode 10. If Ray wants to dig another hole in the desert and kill him, I'm good. These teacher/student stories are so over. Just make them go away. That (and why Daryll wasn't picked up instead of Bunch) was my only beef in an otherwise perfect hour. The Donovan family has enough drama to carry the entire series without bringing in all the special guest stars, not that I'd toss the entertainment value that has come our way courtesy of said guests. 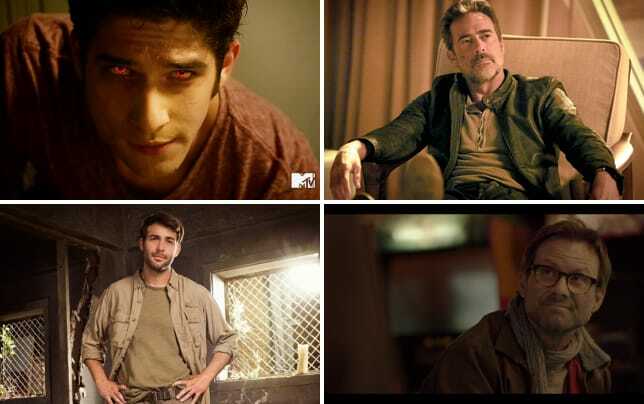 It's just a testament to the core cast that they can carry the drama so well on their own. What say you all? Hit the comments. Dig the hour as much as I did?